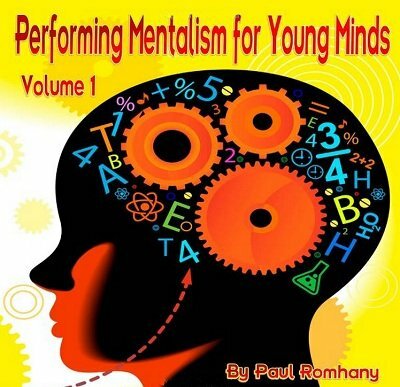 Paul Romhany has produced the most comprehensive collection of material for the performer who wants to add mentalism in their show from pre-schoolers to high school students. Everything from walk-about routines to birthday party routines to parlor and even stage routines for the family entertainer. Over 265 pages which include a collection of essays on how to perform mentalism for children, plus over forty effects from performers around the world including: Mark Strivings, David Kaye, Tim Mannix, Paul Romhany, Richard Webster, Andrew Gerard, Wayne Rogers, Tony Binarelli, Bev Bergeron, Jim Kleefeld, Keith Field, Danny Archer, Jack Dean, Greg Arce, Anthony Lindan, E. Raymond Carlyle, Professor Spellbinder, Matthew Johnson, Tony Chris, Cris Johnson, Reg Blackwood, Ken Ring, ChristopherTaylor, Chrisotpher Berry, TC Tahoe, Ozzy D, Magical Michael, Magic George, Ken Dyne, Jasper Blakeley, Ray Roch. This ebook covers performing mentalism for pre-schoolers to teenagers, even adults will be fooled and entertained by the routines in this ebook. A treasure trove of effects, essays and advice from real world performers who make their living by entertaining family audiences. This ebook is destined to become a classic in both the magic and mentalism field. If you ever wondered if mentalism can be performed for young minds then this ebook will show you it can, and how to do it. Cereal Box Prediction Larry Mahan and Robert D. LaRue, Jr.
A TRIP ROUND THE WORLD IN 8 MINUTES ! by Tony Binarelli and "Jules Verne"
1st edition 2011, 265 pages.